After UFC champion Ronda Rousey criticized the 5-year suspension of fellow fighter Nick Diaz (#FreeNickDiaz) for testing positive for marijuana, controversial ESPN commentator Stephen A. Smith took exception and gave his take on the issue. Rousey noted the ridiculousness of suspending Diaz five times as long as his opponent, Anderson Silva, as Silva tested positive for steroids, a performance-enhancing drug that can put opponents in serious physical danger. “Rowdy” Ronda Rousey is a refreshing athlete at the top of her game who isn’t afraid to speak her mind and take on important issues, from marijuana policy to the Armenian genocide to encouraging women to have their own career and not rely upon others. While Stephen A. Smith attempted to disparage the world champion as someone who has “puffed and passed on a few occasions” because of “how she sounds,” any usage by Rowdy would further highlight the absurdity of punishing athletes for consuming cannabis. Smith has a long history of backing punishments levied against professional athletes for marijuana. The commentator’s support of the status quo is disappointing as the cultural stigmas and biases against cannabis help perpetuate the Drug War, a war that disproportionately hurts people of color. Further, Ronda Rousey has had an ongoing feud with boxer Floyd “Money” Mayweather while Smith has been an apologist for Mayweather and other domestic abusers; Smith’s blaming of domestic violence victims following the infamous Ray Rice incident led to a suspension from ESPN. 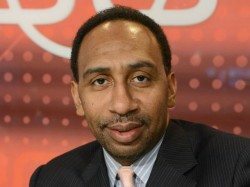 Stephen A. Smith may be a bit biased in going after Rousey, as he is standing up for his (convicted domestic abuser) buddy. I encourage everyone that supports cannabis legalization, privacy, freedom and good policy in general, to support Ronda Rousey in anyway that you can. You can let the champ know that you agree with her on her social media outlets, buy her licensed merchandise, support her sponsors and purchase her fights. Rowdy clearly isn’t afraid to stand up for what she believes in, but we should still let her know that she has plenty of people in her corner as she comes under attack from uninformed and ignorant blowhards like Stephen A. Smith.